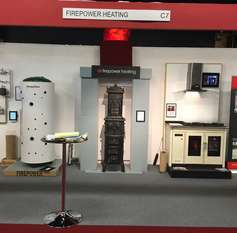 Following a hectic week-long show at Grand Designs Live at ExCeL London, our exhibitions crew (Andy, Jamie and Dan) took the Firepower travelling show up to Harrogate for the trade-only Hearth & Home Exhibition. They built a great-looking stand and we were chock-a-block for the whole three days. We showed some of the latest Woodfire boiler inserts, including the double-sided RX 30 and new RH dry models, as well as the free-standing and insert Walltherms. The four Klovers we had on display included the latest Traditional Smart 120 pellet cooker in cream, which attracted a lot of admiring looks and was a finalist in the Pellet Appliance of the Year Awards. Lots of people were very taken by the Fondis corner model, as it is an unusual configuration for this country, and the ease and smoothness with which its large right-angled glass door slid up and down left you in no doubt as to the quality that Fondis build into all their stoves. We also showed a beautiful antique stove that was cast in a foundry in Denmark 100 years ago. It served to remind everyone exhibiting there, many of whom are convinced that they invented the stove, that they are just part of a long heritage stretching back to when the first caveman put some stones around his fire and discovered that it worked better like that! As always, we had the giant Firepower flame flying up from the stand, and now the flame and the show are heading north to the Royal Highland Show in Edinburgh, which runs from 18 to 21 June. You'll find Andy there with Greenflame Installations in the Renewables Area - Stand 19, Avenue 11.